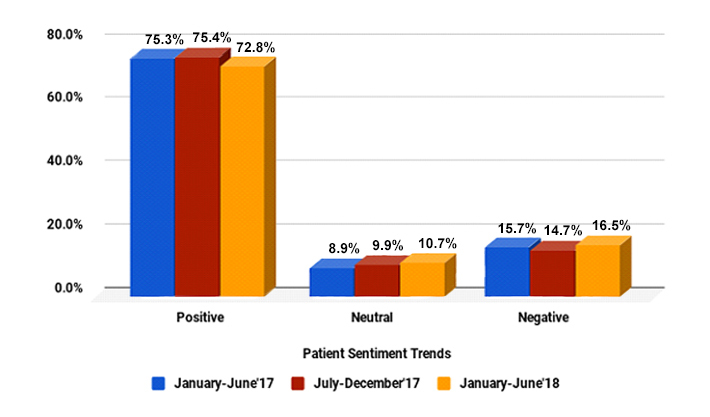 While more patients rated their experience higher, positive sentiment saw a decline of 2.6% in January-June’18 as compared to July-December’17, which, if not addressed, could be an early indicator of future decline in satisfaction. 92% of patients gave positive ratings about their visit to urgent care centers, up from 89% in July-December’17. 1% rated their experience neutral, a decrease of 4.7% as compared to the previous report of July-December’17. 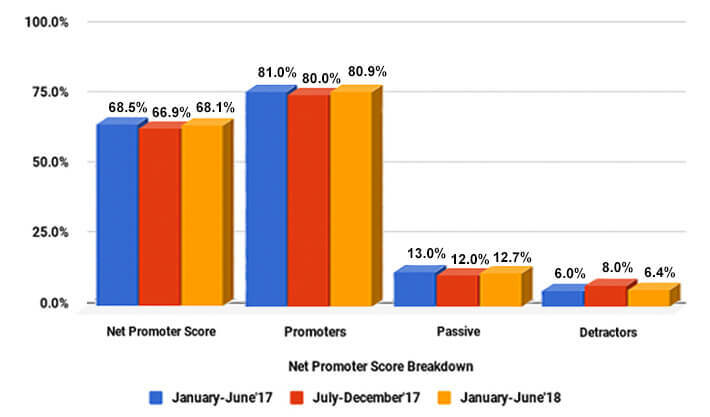 Overall, the Net Promoter Score (a measure of patient’s loyalty) for urgent care centers is 68.1/100 (Total Sample = 4736), whereas it was 66.9/100 in July-December’17. 80.9% of the patients are Promoters, (patients who are likely to refer a specific practice/doctor to a friend or family member), up by 0.9% when compared to July-December’17. 12.7% of the patients are Passives (patients who are likely not to take any action in referring a specific practice/doctor), whereas it was 12% in the last six months of 2017. 6.4% of the patients are Detractors (patients who are likely to deter people from choosing a specific practice/doctor), whereas it was 8% in the second half of 2017. Friendly, Helpful, and Professional were the dominant words used by patients who rated their experience as positive. Since the inception of our first patient satisfaction survey report (January-June 2017), we have seen some changes in the ways patients review their healthcare visit experience, but mostly in how we analyze it. This survey follows on from our first report, comparing the useful insights on reviews and patient satisfaction. The data was taken from our proprietary software RepuGen. This survey measures the LOYALTY of patients for their urgent care and helps in understanding the needs of the patients for developing effective patient-related programs to address their pain points. This will help in developing a stronger bond between the patients and the urgent care facility, and the patients will become the advocate of the urgent care center, resulting in more referrals and fueling growth. 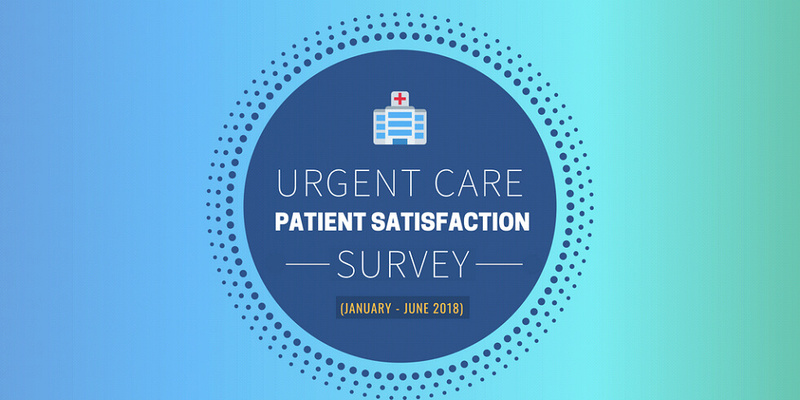 How Do Patients Rate Their Visit to Urgent Care Center Office Based on Their RepuScore*? *RepuScore is the score given by patient on a scale of 0 to 10 when asked their likelihood of recommending the urgent care center based on their experience of the last visit. 0 means will not recommend and 10 means will recommend. 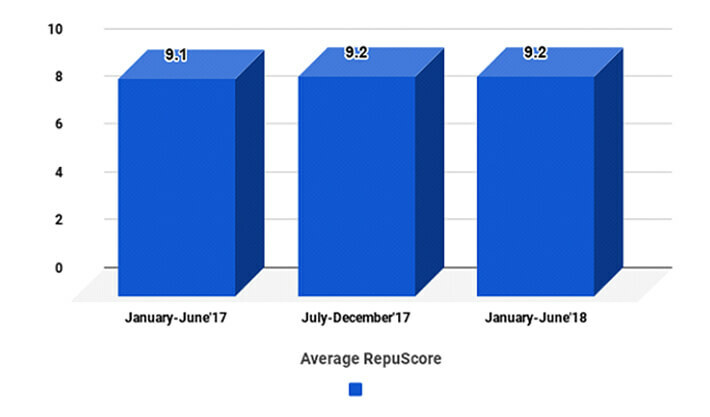 The Average RepuScore remains the same 9.2 as it was in July-December 2017. Given that the urgent care centers in this study were using GMR Web Team tools to address patient complaints, it is not surprising that the likelihood of recommending the urgent care centers remains the same (above the already high levels of the benchmark study). This also validates our view that paying more attention to patient experience at urgent care centers is the key to getting more recommendations from patients. Consistent with the overall data, more patients rated their experience as positive. Patients rating their experience neutral dropped significantly compared to the last survey, whereas ones rating as negative increased slightly. The increase in positive ratings suggests that the efforts by urgent care centers to address their patients’ concerns are helping to improve patient experience. A decrease in neutral ratings shows higher percent of patients rating their experience as positive vs. last time. However, the slight increase in negative ratings also suggests that maybe patients are becoming more passionate about their care, so that a neutral rating just doesn’t cut it – they’re either happy or not happy. Urgent care centers must compare their individual scores with the overall numbers to identify areas for improving patients experience when they visit their office. **The Net Promoter Score is an index ranging from -100 to 100 that measures the willingness of customers to recommend a company's products or services to others. It is used as a proxy for gauging the customer's overall satisfaction with a company's product or service and the customer's loyalty to the brand. Net Promoter Score saw an increase of 1.2% when compared with the last six months of 2017. Percentage of patients who could become promoters increased by 0.7% compared to the last one. 6.4% of current patients are likely to defer people from choosing their urgent care center, a 1.6% point decrease from the last survey. The increase in Net Promoter Score suggests increase in patients’ loyalty to the urgent care center, as well as how increasingly important patient referrals are becoming. Overall, 19% of patients are not likely to refer people to their urgent care center. Urgent care centers need to look at their individual scores and compare with the average number to identify areas where they are doing better and areas where they need to improve. *** Patients are asked to explain their reason for rating their visit the way that they did. GMR Web Team analyzes sentiments and its intensity based on the comments, using an artificial intelligence tool. This gives a better perspective on satisfaction, as a rating of 10 could still be a so-so experience from a patient. Patient sentiment declined from the last survey, indicating a possible future overall satisfaction decline among the urgent care center patient. 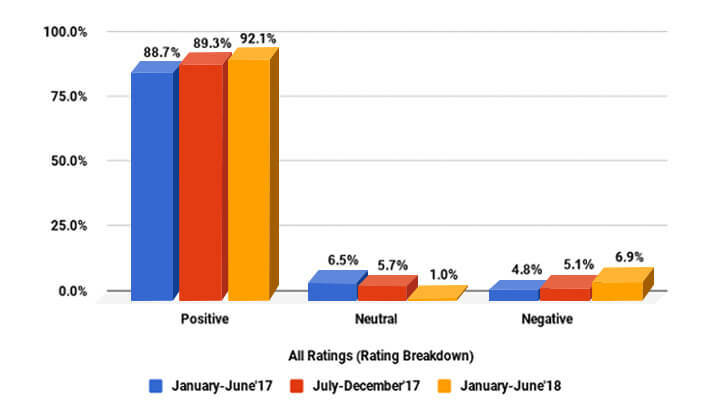 Positive sentiment saw a decline of 2.6% in January-June’18 as compared to July-December’17. There was a slight increase of 0.8% in neutral sentiment in January-June’18 compared to the last report. Negative sentiment also increased by 1.8% in January-June’18 as compared to July-December’17. Urgent care centers need to identify patients who showed neutral and negative sentiment and address them personally as soon as possible. The reason this is so vastly different from the RepuScore is that this relies on artificial intelligence to scan the REAL comment of the patient, not just their 0-10 rating. Ratings are generally a less accurate way to measure a comment, as the most common ratings are a 10 or 0 – yet most people who rate this high or low are not this happy or dissatisfied. You need to measure the context of their comments, which is what this AI sentiment analysis tool does – at about a 3% margin of error. This also shows the online review scores aren’t always an accurate portrayal of reputation, based on how much the ratings are skewed. Note that a negative sentiment doesn’t equal an unhappy patient. Taking a comment as a whole, an AI sentiment analysis tool could take a positive rating as negative for something as simple as ‘the wait time was too long’. **** Word cloud analysis uses the frequency of words used by patients and picks up the most used words. Size of the word denotes frequency in the chart. 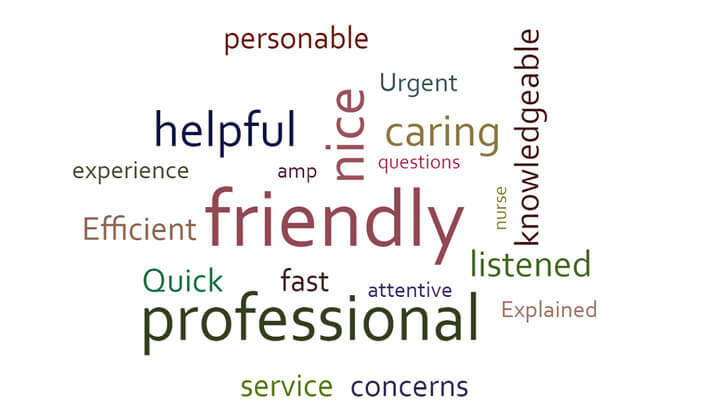 Friendly, Professional, Helpful, Knowledgeable, and Listened were the most used words among patients who rated their visit between 9 and 10. Efficient, Quick, Caring, and Nice were some other frequently used words. Frequently used words by satisfied patients should resonate a positive sentiment, and thus could be used to build expectations for new patients, knowing fully well that it will resonate and that the practice will be able to fulfill the promise. An example could be making a bold statement like Listened, Caring, Friendly, Professional – these are the most used words that patients use to describe their visit. 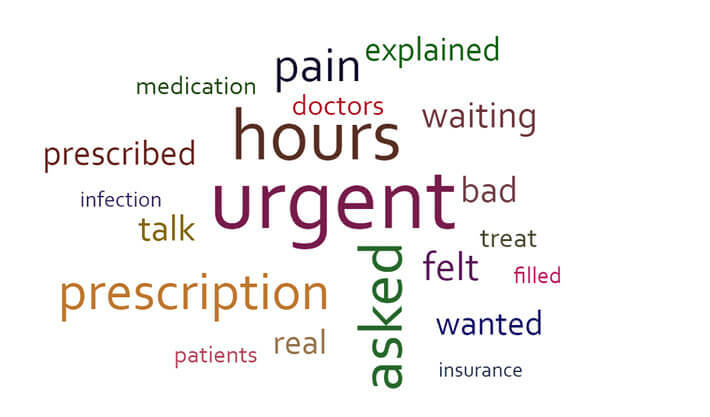 Urgent is the most frequently used word by unhappy patients. Hours, Prescription, Prescribed, and Pain are other negative words used by patients. Frequently used words by unhappy patients allow the urgent care centers to gauge patients’ reasons for dissatisfaction. However, given the fact that the comments of patients were detached, we can assume that Urgent and Hours were among the major concerns. These words are more relevant when linked to the patients (which GMR Web Team account holders can do), and also when analyzing the complete review written by the patients. *HIPAA - The Health Insurance Portability and Accountability Act, a US law designed to provide privacy standards to protect patients' medical records and other health information provided to health plans, doctors, hospitals and other health care providers. An online survey was conducted from January 2018 through June 2018 among 4,736 patients, belonging to urgent care centers that are using GMR Web Team service. We then compared the findings with the first six months of 2017 (January through June 2017) and the last six months of 2017 (July through December 2017) to show the actual trends. The patients were asked to select their likelihood of recommending the urgent care center based on their latest experience on a scale of 0 to 10. Patients were asked to explain the reason behind their rating. All the information (rating score and comments) was detached from patient and doctor identification to make the report HIPAA* compliant. GMR Web Team cannot backtrack comments or sentiments to link Net Promoter Score or sentiment to any patient or urgent care center that were used for this report. Patients were then classified into 3 categories – Promoters, Passives, and Detractors. Promoters: Patients giving a rating of either 9 or 10 to their urgent care center were classified as Promoters. They are loyal enthusiasts who will keep referring the urgent care centers to other patients. Passives: Patients giving a rating of 7 or 8 to their urgent care center were classified as Passive. They are satisfied but NOT enthusiastic patients who are vulnerable to competitive offerings. Detractors - Patients giving a rating of 0 to 6 to their urgent care center were classified as Detractors. They are unhappy patients who can damage the reputation of their urgent care center and impede growth through negative word of mouth. All comments were grouped by positive, negative, and neutral ratings. An established 3rd party artificial intelligence tool RepuGen was used to gauge patient sentiment by group (positive, negative, neutral) and also to gauge the intensity of the sentiment based on their comments about their experience. GMR Web Team proprietary software RepuGen was used to analyze word density of comments by group for all patients to identify words used by patients to describe their experience. Why Is the Urgent Care Patient Satisfaction Benchmark Report So Important? Online reviews and recommendations from existing patients are the best source of new patients for urgent care centers. In-depth analyses of patient experience helps urgent care centers identify their strengths and weaknesses, giving them the knowledge to make positive organizational changes. Understanding the patient sentiment and its intensity provides insight into the patients’ mindsets after they leave the office. Urgent care centers can use the information to improve satisfaction and brand their practice consistent with the positive sentiments generated by their service. Density of words extracted from patients’ comments of different groups will help communicate the desired branding effort better. Urgent care centers should gather patient experience information to better understand patient sentiment, and ultimately improve patient care and satisfaction. Improving online reputation by requesting happy patients to share their information on the internet. Over 30% of prospective patients select their doctor solely based on their online reviews. Developing an automated referral program that requests happy patients to recommend their urgent care center to others. Contact us at www.gmrwebteam.com to learn how you can start building your patient satisfaction data and how to use it to generate more patients.